Fujii Butsudan specializes in selling and restoring Buddhist altars and their fittings. Catering to various customer needs, we have more than 100 altars available for sale. Types of altars include Kin (gilded)- Butsudan for Shin Buddhism, *Karaki (foreign wood)- Butsudan for Zen Buddhism, compact altars, and modern, furniture-types, etc. We can also custom-make or modify altars upon request. In addition, we deal in a wide range of incense products as well as Buddhist rosaries, home shrine articles, and items necessary for grave visits. We look forward to offering you our carefully selected, high-quality, traditional Buddhist altars. Susumu Fujii, our 6th president and a Buddhist altar craftsman, is always ready to meet and discuss your needs and requests about Buddhist altars. *Karaki-Butsudan is made from precious wood such as ebony wood or red sandalwood. 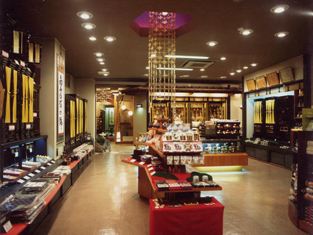 Genpachi Fujii, the founder of the shop, was originally hired by the Ii clan in Hikone in the current Shiga Prefecture as a carpenter for temples and shrines. In 1855, he started producing and peddling Buddhist altars with a carrying pole. 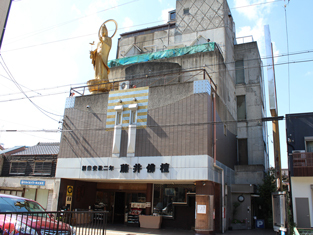 He learned at that time that not many people in Gifu had household altars but a lot of Buddhists there belonged to Jodo-shu (Pure Land Buddhism) or Jodo-shinshu (True Pure Land Buddhism or Shin Buddhism) that have a high regard for Buddhist altars. Therefore, Genpachi decided to move into Gifu when he was in his 30s. He was not only a good businessman but also a very proud craftsman and never compromised in producing the highest quality of Buddhist altars. Thanks to his dedication to his craft, he earned a reputable name. One hundred and fifty years later, Susumu Fujii is the 6th generation of this long-established business, committed to passing down their authentic tradition to the generations to come. The relationship between Buddhism and incense dates back to pre-Christian India. Various kinds of incense products are available as gifts, and for religious and private use.